Back in April Auckland Transport released a summary of a business case they’d produced for internal use to help with their planning and procurement for the project. The new business case took into account all of the changes to the project that have been made over the years as well as AT’s improved understanding of the project and other changes within Auckland. The business case found the project has a Benefit Cost Ratio of 1.6-1.7 thanks to $2.96 – $3.2 billion in benefits coming from the project. Last week the herald triumphantly announced that the cost of the CRL had blown out by a cool $500 million up to $3 billion but as I wrote following that article, the actual cost was $2.5 billion +/-20%. So it could be that when tendered the project comes in lower than currently expected. The cost blowout was overblown. While looking at some details for that article, I found that Auckland Transport had actually published the full business case online (8MB), not just the summary like they had earlier. While the summary was useful, the full business case contains a lot of information and so with this post I thought I’d have a look at some of it. The first thing that I noticed is the report pulls a lot of history and previous reports together as part of explaining why the project so important. Perhaps one day I’ll do a post in more detail about this info but if not, I’m sure it will be a useful resource for students and studies in the future. The diagram below can take a bit to understand but shows roughly where, when and how construction will take place across the entire project. Related to construction, this comment caught my eye as part of talk of altering some designations (page 50). I’m guessing in part this is about providing better footpaths along this part of Albert St. 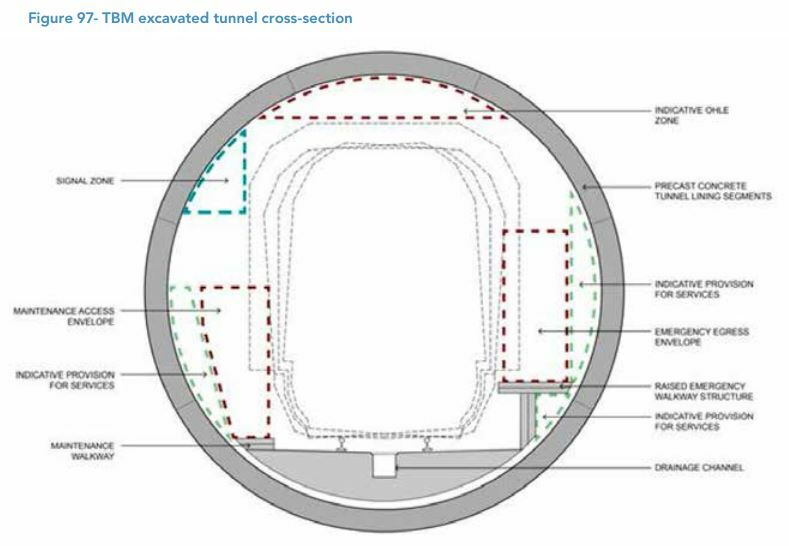 This diagram shows the cross section for the bored tunnels. They say it needs an indicative internal tunnel diameter of 6.24m. The report gives an indication as to the capacity the rail network will have once the CRL is built. Once the principal constraint has been addressed, with the CRL turning Britomart into a through station, it will be possible to run up to 24 services per hour, each way, through the Link, with initial plans for 18 services per hour in the peaks. Ultimately, advanced systems and further investment might see that figure rise to 30 services per hour. Currently Britomart is limited to 20 trains arriving per hour so we go from that to 36 an hour with the CRL initially and up to 24 in the future while we might eventually get up to 30 an hour. 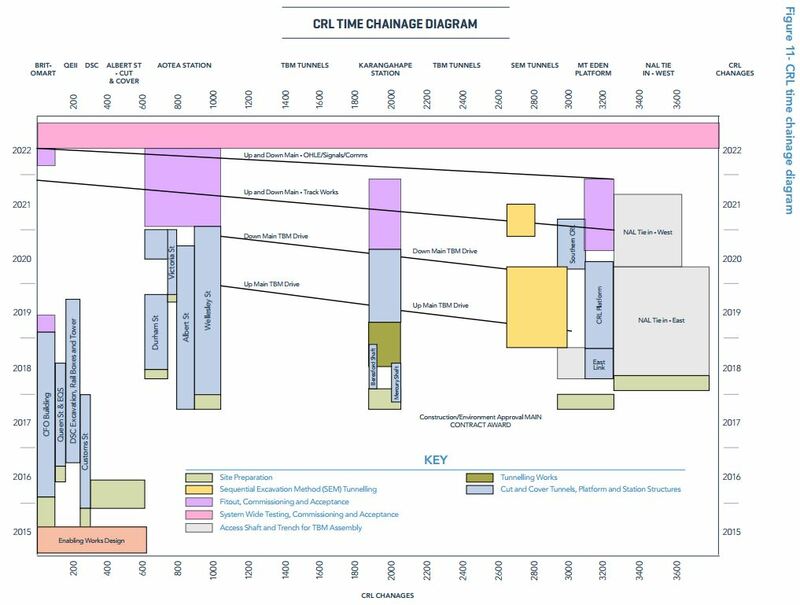 They say that whilst the actual operating plan will be confirmed closer to the opening date, the running pattern below is what they used for planning and modelling purposes. 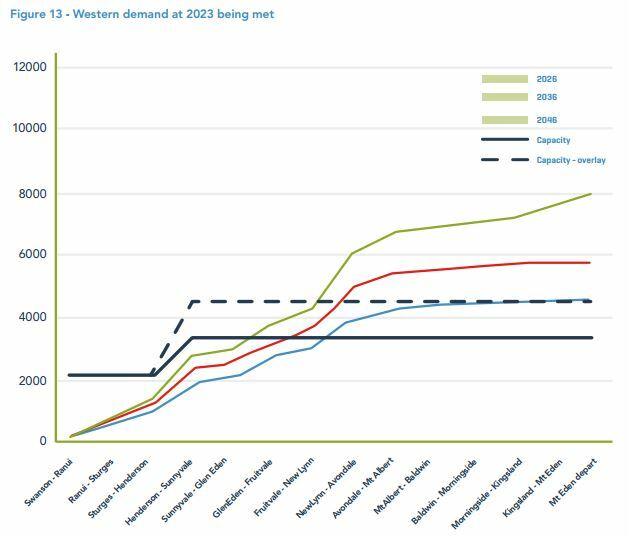 Figure 13 below shows as an example how train capacity was matched against predicted demand by decade by line, in this case the Western Line for 2023. The capacity line represents 6 tph x 3 car service starting from Swanson, 3 tph x 3 car service starting from Henderson and a 3 tph x 3 car peak overlay starting from Henderson. Similar analysis was carried out for other lines and decades. Over time, as demand increases, as the fleet size is increased, an increasing number of trains can be lengthened to 6 car operation, and the span of operation of the peak overlay can increase from 1 hour to 3. This suggests the plans are to only run 3-car trains at the opening of the CRL. As covered later, I think they’re underestimating just how popular the CRL will be and given we already have 6tph, some of which are 6-cars in length, and on some services they’re getting full I think AT will need to revisit this. I’m also personally unhappy that despite the CRL there is no service improvement past Henderson (or at Manukau). One last interesting comment on this, they say “until sufficient level crossings are addressed on the western line, a Henderson – Otahuhu service has no capacity to operate”. There has been a lot of modelling on patronage – although like most previous predictions we’ve seen I think they’re on the low side. The CRL will be transformational and change like that is hard to correctly predict when using models that are based on current habits. The table below shows the current and predicted AM peak trips to the city (CRL includes the three CBD stations). It is expected that about 40% of that growth (green) comes from people otherwise using buses (but they may still use a bus to get to a station), the remainder is from new trips or those who would otherwise have driven. 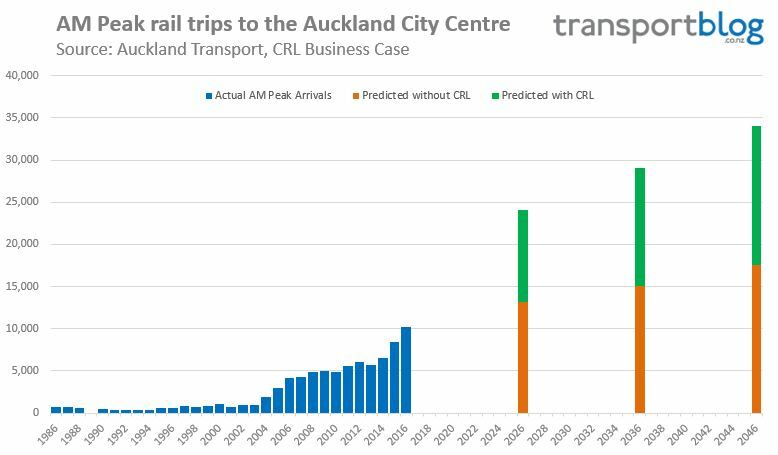 I’m a bit sceptical about just how much impact the CRL will have for buses as from memory Britomart was meant to decimate bus usage but it has grown too. Also the table below shows where patronage is expected to change. It seems unlikely that some of those routes will see any impact at all, for example on Richmond Rd. As part of the modelling, the future patronage projections were updated to reflect the surge in usage we’ve been seeing in the last few years – but only for the short term and so they decided to leave the long term predictions unchanged. They say that “it is clear that this is highly conservative” and my gut feeling is that after opening we’ll quickly see usage rise to hit 45 million rail trips a decade or more sooner than they suggest. The biggest limiting factor is likely to be that we won’t have enough trains due to the wrong modelling saying they aren’t needed yet. The summary document talked about how just within the CRL footprint there was 4.9ha of developable land with a potential floor space of 210,000m² to 250,000m² and which has an estimated value of $1.2-$1.4 billion. The business case also looks wider development across the city enabled by the CRL. They say modelling suggests the CRL will increase the feasibility for new dwellings within rail station catchments by 41% from about 40,000 to around 57,000. It’s also worth noting that the Mt Eden figure excludes the land counted earlier as part of the CRL footprint. As mentioned the CRL has a BCR of 1.6-1.7 depending on the growth scenario and using the standard NZTA evaluation manual. That BCR stacks up even under higher discount rates and cost sensitivity testing. For those economist types, the report breaks down all of the various components of the benefits that have been calculated. The table below shows the capital costs of the CRL inflated to the expected dollars of the day. Operating costs are estimated at around $50m per annum when the project opens rising to nearly $80 million by 2046. As a comparison, last I saw we spend around $100 million on running trains in Auckland and the report suggests that due to the CRL providing shorter routes there will be savings on the running costs outside of the tunnel. The estimate that in the first year there will be around $20 million in additional fares from the CRL but that will also be related to the anaemic growth they expect. Overall I thought there was some fascinating additional information within the business case. Great to finally have this in the public domain. Hopefully nobody will ever refer to the hatchet job BCRs in MoT’s business case review again. I agree the patronage seems conservative. Anyone know how these models actually work? In practice this seems to be the result of dozens of assumptions buried deep in the models when they were first written back in the sprawl era, and apparently its all too hard to fix them. Lord knows why? Anyway it goes something like this; everyone wants to drive, the conditions of driving are ideal, and any route or mode that deviates from this ideal, point to point, direct, one seat journey, accrues penalties in both time and money, which the model outputs as lower use than the alternative. The alternative, driving, is conversely assumed free from many of these costs that bedevil Transit and Active modes, and in particular rail. For example every driver is assumed to have their car next to their bed and to park it next to their desk; so while there is walk time added to Transit users, no circling time looking for a park for drivers. All drivers are CEOs and Transit users are plebs. In particular the models really punish transfers, they are assumed to be expensive in time and money and therefore kill journey time; no rational person would do this. This seems to be the particular way that rail is under predicted. 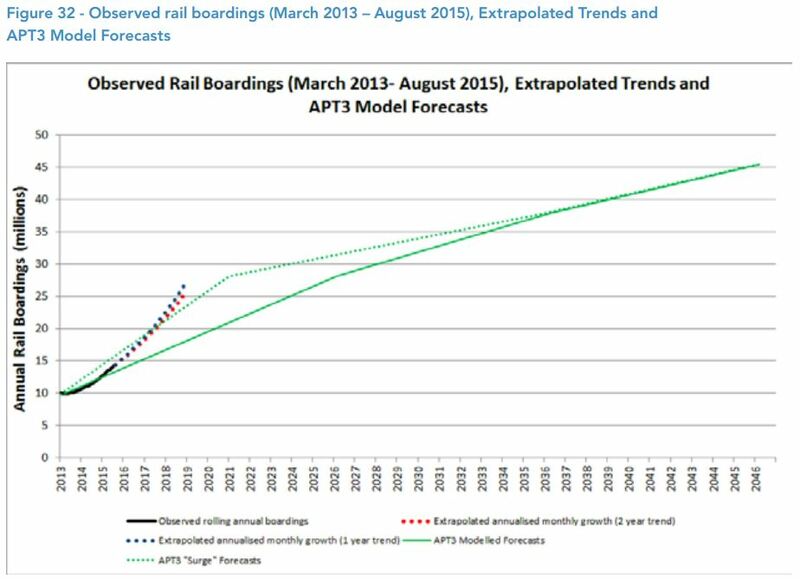 As rail growth is predicated on transfers and this is already observable now. The modellers know we will have integrated fares soon so they must have at least removed the extra financial cost for transferring? Anyway the real problem is as Matt says; the model under-predicts, so the real demand isn’t planned for, so the capacity isn’t there; so it becomes self-fulfilling…. So it goes. Motordom’s long shadow. To add, it’s a multi step process. First they use the regional transport model to work out overall transport demand and rough modal share. That’s based extrapolating various observations and predicted land use. As Patrick says PT is often considered a last choice option. They’ve admitted the regional transport model is hopeless at working out PT properly so the number and locations predicted to use PT are then fed through the Auckland PT model to work out what mode they’ll use etc. That includes a crowding function so it buses too busy will put people back to driving etc. Like Patrick says that doesn’t really like rail. In the past even the MoT say it is likely underestimating PT. The focussing on ‘crowded out’ seems to mean there is a structural interest in the model for generating more drivers through under-delivery of PT services. I am not given to conspiracy theories much [incompetence is much more common], but if you were trying to understand how it could be possible to move the public to the shinny new highway system from their habitual Transit use [and AKL had the highest per capita PT use in the western world in the 40s/50s] this would be a handy tool….? It the 40s and 50s there was no widespread car ownership and the PT went to the CBD where the workers worked, the PT still goes to the CBD but 70% of the workers don’t work there. I think that is switching between each way and one way. So it will be 36 trains both ways but then 24 each way (so 48 both ways) and then later 30 each way (so 60 both ways). So potentially the system could deliver trains every 30 secs, which is in line with London peak time service. I am pretty sure that is right. 60 per hour is one every minute. It’s potentially 60 trains an hour total, with is 30 an hour on each track, I.e. 30 each way. That means trains every 120 seconds x2. That sort of level really pushes signalling systems, and it’s close to the physical limits of dwell times for getting people on and off. If you want more than that you need metro style trains with four or more doors per carriage, perfectly level floors etc. We have to bear in mind that CRL is also at absolute limits of HR rail gradient for acceleration which also increases required headway. As the CRL is not going to have freight trains through it there is no need to build it to conventional HR gradients, the current EMU fleet performs more like a LRV than a conventional HRV. Fine then, the CRL is at the maximum grades for the EMUs which increases the minimum headway. You need to educate yourself on the capabilities of the current EMUs. Railways have to build in redundancy. I suggest you do a calculation about what happens if a stationary six car set about to pull uphill from Aotea loses power to one of the three car sets. Sailor Boy, stop peddling these gradient myths. The CAF units are rated such that a fully-laden failed unit can be pushed uphill by a rescue unit. That means H E A P S of power for normal operation. Kindly desist from mischieviously dissing the heavy rail mode. Sailor Boy has to dis the HR option so he can lie back and fantasize about his LR. This isn’t a myth. The emus caning accelerate uphill in crl at the usual 1m/s2 so the headway week have to be longer than comparable systems. The same is rete for the lrt proposed on queen street and up Sh20 which is why there are no stations on the steep bits. On the LRT plan I would say there are no stations on the steep bit as there are very few people there; and that holds whatever form of Transit you put in, including BRT. That is a great disadvantage of only being left with motorway corridors for RT; instead of reserving RoWs long ago. Although the full irony here is that in fact the catchment-severing motorway is of course on a rail reserve! I’m not sure why Sailor Boy keeps on with this whole gradient thing. Our EMUs were specifically designed to have enough power and traction to easily get up the CRL gradient. We get it you love trams…but give it a rest. Bruce, please stop the personal attacks. Will the acceleration of a vehicle be slower on a steep gradient? Is acceleration an important factor in headway spacing for trains, given that they have to clear signalling zones to allow the next train in. Knowing those two things, will the gradient effect the ability to run trains as frequently as some flat lines achieve? If the answer to all 3 wasn’t yes then you need to re-check your working until it is. Then ask yourself thee following questions. Did Sailor Boy specifically state that the same restrictions apply to LRT? Noting of course that LRT is governed by the same laws of physics. Has Sailor Boy ever claimed any preference for LRT over HR directly, or has it only been in thee cases of the individual North Shore and airport corridors? Did Sailor Bay support HR to the airport via Onehunga until he saw the AT investigation and couldn’t find anything wrong with AT’s workings? Has Bruce failed to provide a single explanation of how he thinks that AT have fudged the figures for Airport Rail? Would Sailor Boy be over the moon to find out that AT did fudge the numbers and the HR is actually the better option for the airport? Again, if the answer to all of these wasn’t yes then please check your working until it is. It is interesting that they haven’t factored in tourism and educational economic benefits (unless agglomeration means more than a muddle of stuff in a bucket). The potential expansion in these two areas will be significant, making Tamaki Makaurau more accessible will inevitably add to its attraction as a study and tourism destination. I am of the disposition that cost is irrelevant, to truly be classified as a developed city, the metro is key. 45m in 2046 is laughably low. But then any 30year prediction is surely going to be nonsense. Lets think about the first 5 or 10 years of the new system. Come 2022/23 when it opens we can reasonable expect 20-25m annual users, unless of course they fail to order some more trains soon, which will limit capacity. Isn’t it reasonable to at least expect the current 20% growth to repeat for let’s say the first 4 years. And 4 years at 20% is a doubling. I have absolutely no qualms in calling 50m before 2030. And pootling around with 3 car sets at the peaks is absurd. I can only assume they were told to take train purchases out of the business case. Which is probably fine as we need them earlier, so should already have them, but then they shouldn’t be out off the model. First thing that you get taught in modelling courses is to check that your results pass a ‘sanity check’ these clearly don’t. We will see an explosion of initial use just off of the entire Western line being 20 minutes closer to the CBD by rail. Yes, of course, but I guess that cuts both ways; if the ‘sanity check’ is done by someone who can’t see past the status quo, that may explain why Transit forecasts are so consistently weak and wrong….? Perhaps that staff member needs a sanity check. I did the exercise to see how the system could cope prior to the CRL being commissioned. I found that the current system would need tweaking to get to 40 million boardings/year without the CRL. About $12 million to raise the capacity of Britomart to 40 trains per hour, pocket sidings/platforms here and there to allow short runners, and a bunch of extra trains. If 45 million is all that AT are aiming for, then the CRL is hardly needed. About $12 million to raise the capacity of Britomart to 40 trains per hour. Eric, are you saying you did the exercise is a professional capacity or just from an armchair point of view? I would agree with Sailor that $12M wouldn’t even touch the sides. It would already be done if it was that cheap. They’ve already looked at what can be done to increase Britomart capacity. If not the CRL then it requires digging a new station next to the current one which is expensive and delivers none of the benefits of additional stations and faster trips. And if you put the graph for the Northern Busway alongside this, you’d get a similar result and, surely, a recognition at local and central government about where we should be heading with transport infrastructure. Glad to see the confirmation that with upgrades we can see the 60 not just the 48. Will assume it requires moving block signalling in the CRL section, flying junctions at Westfield and Quay Park as well as some strategic level crossing removals. Sad to hear the crosstown is out but hopefully with that and after ATAP AT can start thinking about smaller things like that and bus lanes I steadying of fighting for RTN’s which will be agreed on. If that cross town is cut that would be great, it’s a route dreamed up by people trying to run trains, not plan a PT network. At only 3 an hour is pointless vs just putting the resource to better use upping frequency for everybody. Has anyone managed to confirm if the East-West Link would allow a flying junction to be built at Westfield in the future? NZTA always say rail will be unaffected, like with the Mangere bridge; but then they don’t seem to believe any rail development will happen, and it doesn’t seem we can rely on KR to fight their corner, nor perhaps AT? Why doesn’t Panmure Station have clear and available space for a third track for example? The whole thing is built on a rail reserve, why didn’t KR make that a condition of use of ‘their’ land? Shortermism is rampant. Panmure does have space for a third track, the platform and structures are designed for it. It just needs the removal of a false work wall and a couple of other modifications. However I would ask why it doesn’t have space for a fourth track, the should have planned two island platforms with space for four tracks. hmm Thanks Nick, something I wanted to know. No 4th at Panmure is probably a result of no expectation of freight traffic to warrant it either within the 30 year planning window or the life and capacity plans for the port. To justify that level of future proofing at Panmure, they’d need to do the same at Great South Rd bridge, motorway, Sylvia Park, Waipuna bridge, Purewa tunnel, Orakei rd, both causeways and under Tamaki drive to the port. Capacity of the 3rd is boosted crossing loops at Auckland, Tamaki and Westfield, so the bar is set pretty high to warrant a 4th, especially given future port prospects. Well PoAL say they can triple container volumes at AKL before moving, those containers are going to have leave the port somehow….? I understand that there are plans to build 2 passing loops on the third main between the port and Westfield. Depending on the length of those loops and if the third main is exclusively for freight that could permit a throughput of around 240 TEUs per hour or more. Plenty. Am I right that if they can’t do the Henderson to Otahahu service then there will be no services using the upper level platforms at the new Mt Eden station? I guess it would be good for network resilience anyway when the inevitable track faults in the CRL somewhere. Yes, it would still have some value, I’m just a bit concerned it would be an obvious target of criticism from detractors, especially if the cost has ended up a bit higher than budget. 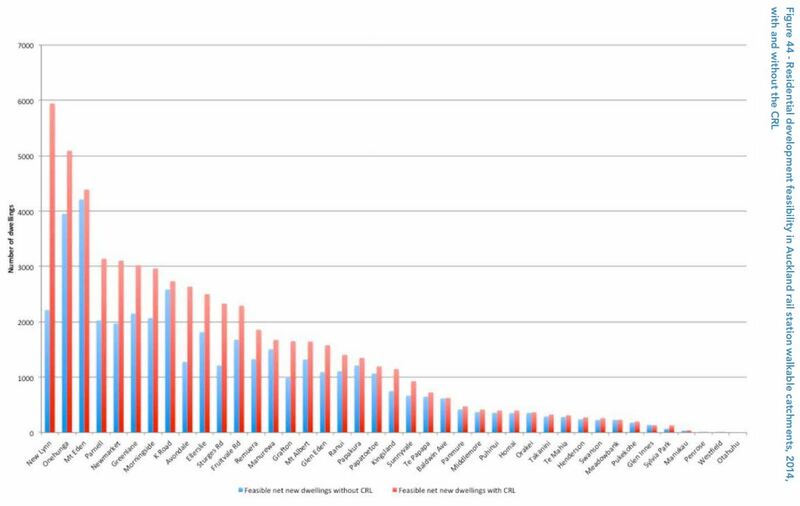 Interesting that the “feasible net new dwellings” graph shows virtually nothing for Henderson, yet the council-owned vacant land next to the Henderson station will become the perfect location for high-rise apartment blocks. Presumably they have assumed that the SHAs in Swanson will have all been built by then, and that the shorter journey times won’t encourage more infill housing or higher density redevelopment around the station? Potentially the same could occur around Sunnyvale station, especially around Bruce McLaren Rd. Actually that whole graph is nuts. Basically no new dwellings at all at Manukau station with or without CRL? Perhaps AT don’t know what Panuku have planned for the block of land next to the station? Or they think it will be done and dusted by the time CRL is complete, and it won’t stimulate demand for more residential development on under-utilised sites in the area? I predict that at least some of that land on the west side is going to be used for an expansion of the Henderson station to 3 platforms for resilience and short running express services. Last week the herald triumphantly announced that the cost of the CRL had blown out by a cool $500 million up to $3 billion but as I wrote following that article, the actual cost was $2.5 billion +/-20%. You wrote on here in a separate post some time ago that the projected cost of the CRL was actually $1.7 billion and that the $2.5 billion figure allowed for over-runs etc. 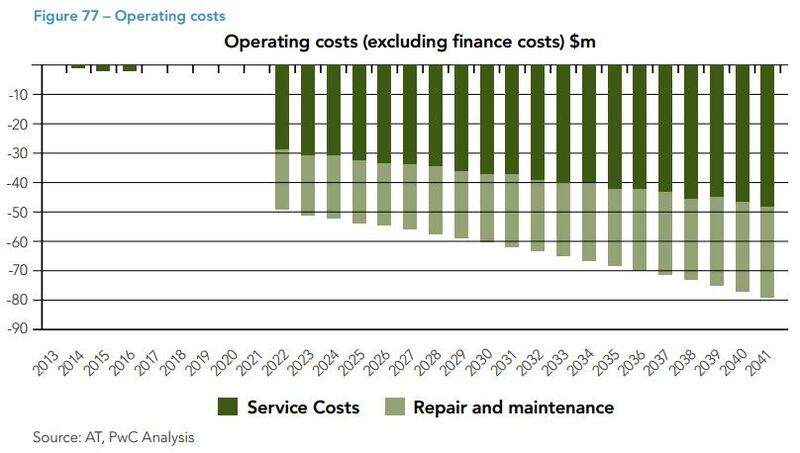 So why is the cost of the CRL now $2.5 billion +- 20% when the $2.5 billion figure included a contingency for over-runs? Also, with any cost benefit analysis additional costs need to be taken into account, for instance operating costs. Have these additional costs been included in the above cost-benefit analysis and netted out with the benefit costs or have they not been considered? I think this is why, assuming 3% inflation from when the first business case was done to the initial mid point of construction explains the difference. It may well be that the contingency for overruns is included in the 2.5m. But my understanding is that the +-20% isn’t about overruns, it’s to cover the uncertainty in the procurement process. i.e. the 2.5m is what we think it will cost, including contingency for overruns, assuming the prices negotiated with suppliers are what we think they’ll be. But all of that needs to be +-20% as until we go through the procurements we don’t know what we’ll be able to negotiate. See 10.3.4 Operating costs in the report, it seems to be covered. With all due respect to those questioning the numbers – still – this project has undergone the most vigorous analysis and business case of any transport project in NZ’s history, including benchmarking against 40+ other options. Its actually getting a little farcical the hoops it needs to jump through in comparison to others, but it would be a little churlish to criticize the process as being too vigorous, when that is what we want for roading projects. We are all armchair supporters/critics here, but the financials as analysed by numerous experts in the field – independent at that – are done, dusted and they stack up. By all means loop round and call for heads if it does blow out, but for now, its time to let it go, at least as far as questioning the numbers from the comfort of our unqualified keyboards. Anything else just starts to sound like opposition based on ideology, not facts. I agree KLK. It’s good to see how robust this project is to changes in operating and capital costs, as well as at different discount rates, and it sets a standard by which all transport projects should be tested. I guess the only criticism I could make is on the benefits side, in that there’s little in the document regarding how robust the figure of $2.889b in benefits really is. 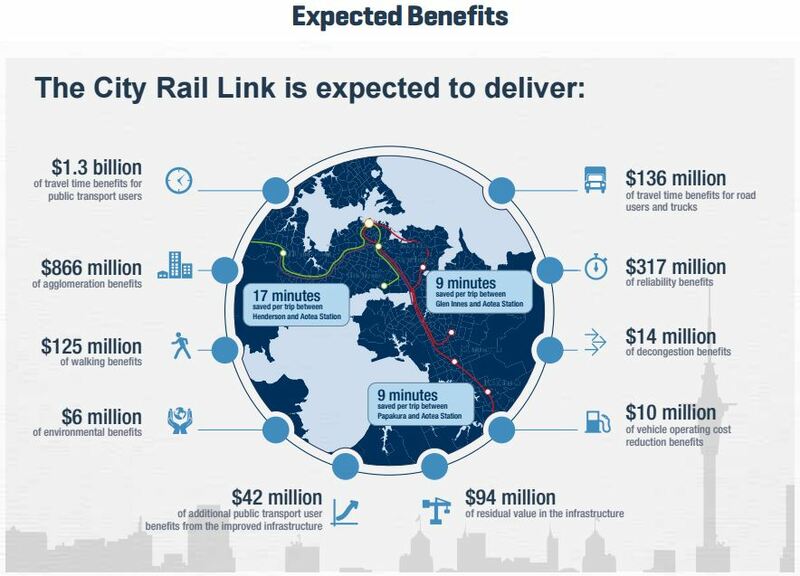 For example, $1.3b of the benefit is in travel time, which in effect is a transfer of wealth from greater Auckland to those who will save travel time through their access to the CRL. And how certain are we of receiving $866m more in agglomoration benefits than we would without the CRL? How sensitive is the BCR overall to changes in benefits calculation? Other than that, and to be fair all public transport investment will benefit some at the expense of others, it is heartening to see the quality of cost analysis being undertaken here. I’m just concerned that AT is too narrow (geographically) in its targeting of public transport benefits. Without doubt the CRL improves services for parts of central/west Auckland, but these areas already have a higher than average public transport share. Ideally I’d like to see an equity objective introduced for AT, such that they are compelled to provide all parts of Auckland equidistant from the centre with more or less equal access to public transport. Otherwise we may find that the CRL will achieve an overall economic gain for Auckland but at the cost of aggravating existing inequities in our provision of public transport. “Have these additional costs been included in the above cost-benefit analysis and netted out with the benefit costs or have they not been considered?” – of course they have, as you say that’s a key part of the CBA. 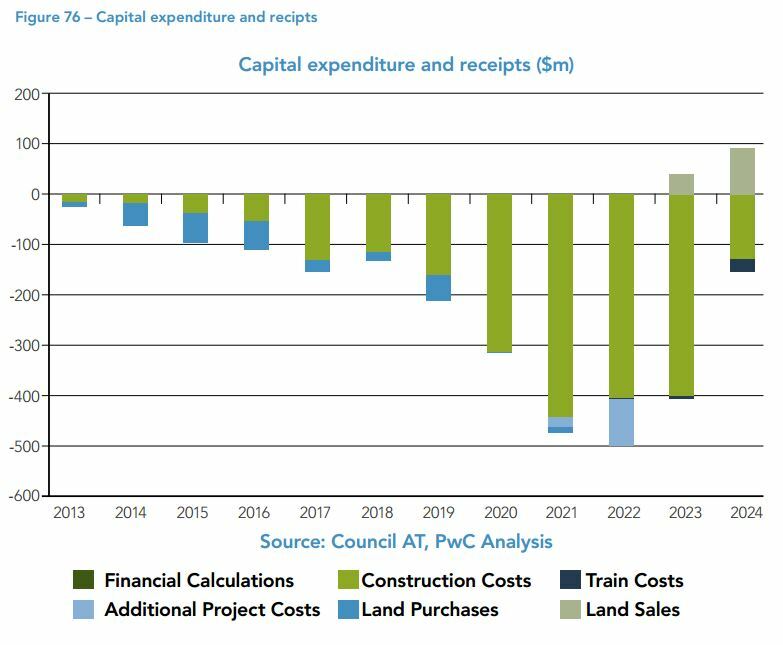 Sad that PT patronage projections are knowingly and endemically underplayed in New Zealand (especially for rail). Seems to be a national trait in Aotearoada. The western line is already at 6TPH. I’d assume this is likely to need to increase further within 5 years. The report says more can’t be run until more level crossings are grade separated. I’d assume this means the busiest level crossings like St Jude St, Woodward Rd, Morningside Drive. This is a pretty short timeframe. Where is the plan? A Henderson-Otahuhu route is required for the school run to Grafton Station. Whats the plan for this not running? I’d hope they could do better than use 36 year old GDP data. Why is a direct ride needed for school kids? Currently there is no direct journey south from Grafton, many manage to transfer at Newmarket. Transferring at K Rd for the west doesn’t look too arduous. The post CRL network simply reverses this arrangement. Oh and adds a direct Eastern line connection from Grafton. Auckland Girls Grammar now gets a closer connection than the currently well used one at Britomart. So even without an infrequent west-south service it’s way better for the schools. And hey AkL Hospital and Middlemore are finally better connected. This is the only reason to run this IMHO, a transfer or walking is probably just too inconvenient here and Southern line trains cant stop at Mt Eden. Gee $3B spent to get $6M of environmental benefits – that’s spending $500 for each $1 of benefit. This is a real eye opener – what an appalling waste of money the CRL is. What an absurdly stupid calculation you mean. Renewable generated electric powered transport that will be used by millions of people instead of fossil fuelled alternative is more valuable than that nonsense figure. Completely agree, would be interesting to assess if the price of carbon were 10 times higher for example. Graeme, why consider only the $6M of environmental benefits in your fatuous assessment. There are lots of other benefits you know, that bring the total benefits up to about $3 Billion. And arguably many of these will lead to knock-on environmental benefits also, aside from the formally assessed $6M-worth. Didn’t you understand that first diagram? But the environmental benefits are not the only benefit to accrue from the CRL. Will the Loading gauge of the tunnel allow for freight? No diesel trains will use the CRL. Hopefully not for long. My point ois that simply saying that diesel trains won’t use CRL doesn’t rule out future freight. I can see advantages in NAL freight going via East and CRL at night to remove noisy trains from a lot of heavily built on areas. There will not be freight trains in the CRL. Can’t be sure because there are no dimensions on it, but that tunnel cross-section diagram accommodates what looks to be the standard KiwiRail loading gauge, plus a bit extra in the top corners. Can’t confirm it, but that how it looks to me. any water from a burst fire main. tunnel’s internal width and height to be adjusted independently. so they can run work trains for maintenance perhaps? Hope he or someone else just as tenacious, does another one now. Let me fix that for you: Tony Randle attempted a hatchet job on the last business case which was rightly ignored by everyone except the handful of raving train haters; especially both the Wellington ones. Funny he had to fight for so long under the Official Information Act, to get some of the data, if the whole case was such a slam dunk in favour. It can be hard to get information at the best of times, that often isn’t evidence of them trying to hide something but often typical public agency behaviour. Well, Prof Bent Flyvbjerg and colleagues in analysing forecasts and actual performance of dozens of commuter rail projects around the world, came up with the terms “optimism bias” and “strategic misrepresentation”. And yet in NZ we see numerous examples of the opposite occurring e.g. 1: Britomart is well ahead of projections – even for future years. See earlier in the comments for the graph posted by Patrick. 2: Electrification is ahead of the 2016 prediction despite implementation being two years late thanks to the government thinking about cancelling it and we still don’t yet have the frequencies promised. 4. If we extend that to include Rapid Transit, the Northern busway is ahead of predictions. In NZ the optimism bias extends the other way with numerous examples of motorway projects coming in under prediction. If “Onehunga tracking ahead of predictions” the less than 25 average people per train (Penrose to Onehunga, the only part that is really a separate line) weekdays is ahead of predictions then what the hell was the prediction? It was actually 38 per train across two stations at 11,500 trains and 432,000 boardings and alightings. That’s actually a lot of people for two spur stations on an inner line frequency booster. The case still stacked up economically lower than those numbers so it would be interesting to see how much the economics improves. Sailor Boy, I prefer the real numbers pre ATs manipulation of them. Sailor Boy you may want to recount the number of trains in your count, passenger services in 237 and 243 out every week making it 24960 trains (services) per year. Adding in the extra 13460 trains that you missed makes the average look pretty grim. Apologies, I must have only counted in one direction and had a longer weekend shutdown. That does seem very low. Will be interesting to see if there has been any more growth. Looking at the responses to that post on kiwblog, those who set out their rebuttals clearly and concisely seem to rip it apart with ease. Those in support basically had two (kind of) sorts of arguments – PT is a socialist evil and neither buses nor trains matter because people in Auckland don’t use it because its a “car town”…. There was also the obligatory (for that blog) racist comment, this time forcing “darkies” onto PT for being such bad drivers…. First time in a year or two I have gone to that bog, won’t be a repeat anytime soon. Seems he posted there for a reason…. Ironically the “agglomeration benefits” are unlikely to be realised because of the way amenity is captured in land prices. Potential participants in the “agglomeration” are “priced out”. The economics profession is acting like rocket scientists who ignore the existence of gravity, when it comes to urban planning, transport planning, and the flow-on effects. In any case, they are confusing “agglomeration” and “clustering”, which are not synonymous. Agglomeration economies have become less and less about proximity / clustering and more and more about transport and communications, as time has gone on. First of all, the agglomeration modelling undertaken for the CRL (or any other major transport project, really) focuses on the second-order effects of changing transport costs. That is, when transport improvements make it easier for people to access jobs, or businesses to access customers, *regardless of their exact location*, they contribute to higher productivity. Second, the agglomeration elasticities used in NZTA’s methodology are measured using data on firm productivity – eg output per worker, taking into account the role of other inputs into the production process, such as land. In other words, they’re measured in a way that nets off any impacts of increased accessibility/productivity on land values. Thanks for responding, Peter. The NZTA is just typical of the best that mainstream economics today can do – my criticism is valid. It is not just the NZTA; there is not yet ANY planning department in the whole world, who has a model that correctly models “land rent” and the “monopolistic” way it is derived under certain planning conditions. I have raised this question on academic forums and none of the experts can give an example. Dimitris Emmanuel (1985) produced the best attempt and has been ignored. There are insights in the literature that accurately state the problem, including Colin Clark (1982) and Anthony Downs (2007). The real life outcomes are what are most undeniable. We have a classic “emperor’s new clothes” problem with urban modelling. Grimes and Aitken (2010) fingered the problem in these terms in their conclusion: “The profit potential in re-development is impounded in rising land values”. I understand your quotation from Krugman, to mean that identifying agglomeration benefits attaching to a specific location, is extremely difficult and becoming more so, not less so. The “focus on tangible forces seems LESS AND LESS applicable to the actual location patterns of advanced economies”. Drennan and Kelly (2011) could find so little evidence of agglomeration benefits in the finance sector in US city centres outside of New York, that they concluded that “the tyranny of distance is dead”. Productivity has risen with city growth irrespective of degree of centralisation. In fact the productivity growth has been higher in the US where cities have been free-er to spread, than in Europe. Land values rise around new transport facilities due to the fact that the location has become more accessible and hence more productive as a place to locate. This isn’t a new insight in economics; it’s been around since the early 1800s. If you’re arguing against urban public transport improvements because they might raise land values around stations, then you have to admit that the same argument applies to road extensions on the edge of the city. IF “land values rise around new transport facilities” is it valid that the citizens of Auckland at large should finance the tax free capital revaluation of the property owners around the planned stations? That’s an argument in favour of a land value tax, not an argument against transport investment. Yes Morton; it’s better we spend billions and billions on motorways that destroy land value wherever they are built. It is also wrong that there is so little connection between the subsidy funding sources, and those who capture the “benefits”. All our concern about inequality and wealth transfers upwards in society, and we haven’t a clue about what policies are actually making this worse. Given the major benefit is in the $1.3B travel time saving for the users – perhaps they should pay for it. Most will be well paid city workers so can easily afford it. I don’t see why workers in South Auckland should be subsidising people on $100K or so? Thing about a journey is that it has two ends. Many of the busiest stations on the network are in South Auckland, you know, that place where the southern line goes. So thousands of those trips that start or end in the city also end or start in South Auckland, or West Auckland, or East, and South East Auckland. This is not a little inner city circuit, for bankers to visit each other, this is a whole network enabler that opens access to all those higher paying jobs to people who live all over the city. People who are qualified for those higher-paying jobs deserve the biggest cost-of living subsidy? “…Heavily subsidised public transport networks are mainly designed to get inner city workers to and from their higher paying jobs. Taxpayer funded cultural, recreational and social infrastructure is concentrated in inner city areas, arguably where it is of more benefit (it is certainly more accessible) to inner city workers than residents of middle or outer suburban areas with suburban employment. With so much intense discussion about urban growth and development typically focused on what happens within a 5 kilometre radius of the CBD, it is fair to ask if this intense focus has diverted attention away from the needs of the majority of lower income (suburban) workers, to the benefit of the numerically smaller but considerably richer, inner city workers.The latter, based on the evidence, have a greater capacity to pay for the infrastructure they enjoy than the suburban worker and taxpayer. You realise that not all train users are workers don’t you? I don’t know the numbers but a large number are students who don’t earn anything at all. Does the author provide a citation for using the term “mainly designed”? I would have thought a public transport network is about, among other getting all workers with access to it to the higher paying jobs in the CBD and everywhere else, wherever they live. In the context of our rail line, it gets those at the very ends and all the way along it into and through the CBD (if that is where they want to go) quicker, more frequently. Not just those in the inner city. They can probably walk and in some cases, the bus will be quicker/more convenient. Besides, I have never heard a coherent response from you or others about what we do when Britomart hits capacity. Price it sky high and force all those millions of users back onto the road? This is so stupid. By definition ‘inner city workers’ are already there. These are not the people who get on the train at Papakura, and Middlemore, or Panmure or New Lynn. We know that rail journeys are, on average, longer than bus journeys. The rail system, in fact, mainly serves to spread access to valuable centre city jobs for people who would otherwise be locked out of them. Anyway, which is it? A dreadful socialist subsidy, or trains for the rich? And ‘heavily subsidised’. All transport is subsidised, including driving. 50% of non statehighway roads are paid from rates, and that’s before we get to externalities. Train riders to the CBD are on average, higher income. Regardless of whether the numbers of them increase. What poorer people mostly need, is mobility to and from locations not in the CBD at all. The best thing is a car, but buses and vans are the PT option. I am not one of those who regard radial, CBD-serving commuter rail systems as dreadful socialist subsidies, I am very much a realist – this is a wealth transfer to CBD property owners, and a cost-of-living subsidy to above-average income earners. However, even that subsidy tends to capitalise into land values, so that those above-average income earners are not gainers to anything like the same extent as the CBD property owners and the vendors of land on the routes. It doesn’t “spread access” to much extent at all. Rails are rails; they only serve narrow corridors of land supply. Roads and cars are what “spreads access”. It is strange that this is so hard a concept for some people to grasp. As mentioned, many train trips are students, not just CBD workers. Also the impacts of the CRL aren’t just to the CBD but across the network from higher frequencies and in that regard there are even more non CBD workers who benefit. Motorways only serve narrow strips of land too and like railway lines can only be accessed at certain locations. Roads form a network to access them and similarly a good PT network will allow people access to rail lines. That comment is true in a tautological way. Heavily subsidised transit networks are designed to get inner city workers to high paying jobs… or more correctly, transit networks designed to just get inner city workers to high paying jobs are heavily subsidised. It’s no secret in transit planning that designing networks just to serve city commuters is horribly expensive and inefficient, and in fact any network that focuses only on one task or group suffers the same fate. That’s the best thing about the CRL, it turns the rail system into a true network that serves all kinds of trips to all kinds of destinations. Workers yes, but shoppers, day trippers, errand runners, Uni students, school kids etc etc too. Those sorts of network run all day, both ways, seven days a week, and are not heavily subsidised as a result. “All transport is subsidized, including driving”. I have spelled this out before. Drivers pay for: their car; their petrol; their repairs; their insurance; their tyres and other running costs; their own parking space at home; they bear the cost of the congestion they impose on each other; they often pay directly or indirectly for parking spaces; and they pay at least a significant proportion of the cost of roads and highways; in petrol taxes, in rates, and in general taxation. PT riders get subsidised for MOST OF: the rolling stock (trains or buses); the energy costs of running the rolling stock; the repairs and maintenance of the same; the drivers and staff; the depots and garages; etc. Automobility’s system-wide cost is made up of around 30 to 80 cents per person-km of costs paid for by the driver; around 2 cents per person-km of “subsidy to roads”; and around 5 cents to 10 cents per person-km of “negative externalities” depending on how much of a car-hater has done the calculations. Positive externalities, which are considerable, are never mentioned. PT’s system-wide costs are made up of around 30 to 80 cents per person-km of travel in SUBSIDIES, and a fare contribution of around 20 to 80 cents per person-km (with the lower figure being for long-distance rail trips and the higher one being for short-distance suburban bus trips). And that is not the slam-dunk selling point for automobility? How many square kms of urban property can be accessed in random travel for all purposes on a rail system, versus for automobility? And your “not heavily subsidised” point is highly relative: it would be fantastic if the Auckland commuter rail system ended up costing “only” 30 cents per person km of travel, in subsidies – but public money subsidies to driving in the long term are less than 2 cents per person-km of travel, possibly even less than 1 cent. Residential roads are higher in cost, but there is an excellent match between the beneficiaries and the payers of the costs – in rates or even, these days, in DC’s. Carless urban apartment dwellers could hardly complain of the burden of cross-subsidy from them “to” road users. If they are also not users of the most heavily subsidised PT – rail to the CBD – they could have grounds to complain about the costs they might bear for that.
. . . “around 2 cents per person-km of “subsidy to roads”; and around 5 cents to 10 cents per person-km of “negative externalities”. . . In a letter (January 24) Philip Hayward cited my transport economics research, stating that compared with rail commuting “the equivalent ‘subsidy to cars’ could be as low as 1 cent and even the famous anti-car activist Todd Litman’s adventurous and debatable data collation exercises scrape the bottom of the barrel at about 7 cents”. To respond: first, much as it flatters me to think otherwise, I am not very famous. Second, I am not “anti-car;” my research emphasises that to be healthy, wealthy and wise, people should use a combination of modes – for example, walking and cycling for local errands, public transit on major travel corridors, and automobiles when truly needed. Third, my research suggests that under urban-peak conditions, automobiles impose more than 44 cents per kilometre in external costs, including road and parking facility costs not borne directly by users; congestion, accident risk and pollution damage imposed on other people; plus costs to your national economy from importing vehicle fuel. Under such conditions, public transit travel is usually cheaper overall. I have no idea where Hayward obtained his estimate, but it is wrong. Its bizarre that some people can’t get their head around the concept. Its not so you can get on a train at the Aotea center and get to Britomart (though you can). Its about capacity and frequency for the entire network, as far south, east and west you can go. Capacity and frequency which is constrained by the Britomart dead-end in the face on what – year on year 20% growth? Nobody asking about the trucking industry paying for the east-west link though….. Same could be said of any motorway project anywhere in the country that does not directly benefit lower socio economic areas. (Page 231)”….If rail and subway services to the centres of large cities were charged at full cost, including interest and depreciation, two consequences would follow. The employers of the lower paid service workers in the city would have to raise their wages, in some cases reduce the services offered, or move to suburban locations (for example, some of the retail businesses still carried on in city centres). Meanwhile the higher paid salaried and businessmen, who in most cases could not change their workplace, would have an incentive to move their residences closer to the centre (while at the same time having less incentive to reside close to railway or subway stations). There are countries, such as Germany and the UK, where petrol tax is so high that they do indeed cover all those costs. The result is around 1/3 less VMT per capita than the USA. I say by all means “bring it on” – price all modes correctly. Car use might fall, but PT in its current regulated monopoly form would die. However, the market would provide something better. Jitneys, for example. And provision of roads needs to take into account the “competitive supply of land” effect. The cost of living space if we had less access to land supply, would be orders of magnitude greater than the cost of providing the roads. This was far more common knowledge back in the era when economists and social reformers were worried about “economic rent in land” and the injustices it caused. Even non-specialists like Henry Ford and Frank Lloyd Wright wrote about the liberation from grinding extractive rent, that cars and roads were bringing to humanity. We seem to have forgotten this after decades of the benefit ending up being taken for granted. “Production” has also been unleashed in numerous forms, in ways that would have been impossible without a collapse in the cost of space for businesses. There are whole new sectors of business that only emerged as low-cost suburban locations became available. A good read for the layman, is “Megalopolis Unbound” by Robert Fishman. Jitneys….? Dear lord. Do you really want to live in a decentralised city full of congested dispersed traffic fighting itself to go anywhere? Trains are spatially efficient. That’s why cities use them. That’s why Auckland’s system is so popular and experiencing such massive growth. Can you also explain, in your world view Phil Hayward, why the trucking industry deserves $1.8billion in subsidies for the East/West connections? The only thing the east west connection does for the trucking industry is make getting freight to and from the railways easier, if it becomes too hard they will just cut out the railways and truck it the whole way. So effectively if you want to call it a subsidy on a particular mode of transport it is actually subsidizing rail freight. Hahaha. Subsidising rail freight huh? If that were the case, there is much more beneficial projects that Kiwirail could do with $1.8billion. This is fairly and squarely a SOV and road freight subsidising project. Bevan if you make it too hard to get freight to and from rail the rail freight will dry up, the east west does very little for road transport other than making getting in and out of metro port (the only road to rail transfer point in Auckland). Also Kiwirail Southdown freight terminal, but this has the same access off Neilson St as Metroport. Plus various other private sidings around Auckland from which rail freight comes and goes, usually involving a road-component in bringing materials to the site or distributing them after processing. Dave maybe you might need a bit of an education about Auckland. “Mainfreight siding (Westfield), Peter Baker Transport + Linfox sidings (Westfield), Mainstream siding (Otahuhu), Owens siding (Westfield)”, you forgot the Coca cola siding but the one thing these all have in common is they are PRIVATE sidings that can only be used by those companies. “Conlinxx sidings (Wiri inland port)”, this is only a early delivery/ late pick up point for the ports of Auckland you can not transfer from road to rail there unless it is going to the ports of Auckland. “Also Kiwirail Southdown freight terminal, but this has the same access off Neilson St as Metroport.” Yes you are aware that to access Kiwirail Southdown you need to get in via Metro port (not an easy task most of the time) by removing the east east traffic off Neilson st it makes access to this facility easier and more companies would be more likely to transfer their non urgent, non fragile freight to rail as it is only a fraction of the cost of trucking it there. Make it too hard and there will be more trucks on the road due to freight being moved the quickest and easiest way. Mainfreight, PBT, Linfox, Mainstream and Owens are all freight-forwarding companies who will take your freight by truck to the depot, then load it onto a train for the linehaul. The fact that they are not Kiwirail-owned doesn’t make them any less usable by the freight-sending public, or any less-valid as road/rail transfer-points! I didn’t “forget” the CocaCola siding – I simply generalised it under “..Plus various other private sidings around Auckland..” – these being traditional “private sidings” where the freight they accept is indeed confined to the commodity-speciality of the company. Conlinxx at Wiri – correct – you can only send freight to the Port from here, but – being pedantic – it is still a road/rail transfer-point. Regarding Southdown, yes I know its access is hampered by congestion along Neilson St, but there have got to be other ways of impacting this than a $1.8 Billion motorway. Improved access for railfreight at this particular site is not remotely a justification for this overblown scheme, even if it would end up benefitting. You could re-locate the whole Southdown operation 50 times over for that sort of money. Dave but if your freight forwarder is not Mainfreight, PBT, Linfox, Mainstream and Owens (who are also Mainfreight) you need to send your freight/ container to Southdown to rail it anywhere. If you were to relocate that facility along with the required upgraded roads to that facility would easily eat up $1.8B then some. Is anyone asking, where in the business case, is the breakdown of capital costs? What is even included in the capital cost aggregate figure? AT have said separately they don’t want to release the specific details as that could impact tender results. Ah, very convenient – So presumably the public will get a chance to “speak” sometime between those costs being “known”, and binding contracts being entered into? Yeah, right. Of course I presume that the mainstream media will inform the public responsibly in the event that they do have reasonable opportunity to do so. The public have spoken and the vast majority support the project. It is highly unusual for there to be some form of consultation on commercial contracts. Don’t ever see any other government agencies doing it, why should AT? Suggesting this sounds like the desperate attempt of someone who hates the project to try and stop it. The vast majority support the project (I don’t dispute that) on the grounds of falsehoods that they believe. Such as that “so many other people will use it, the roads will be less congested for me”. I have yet to meet anyone who supports the commuter rail investments on any other grounds. They all actually want a less congested road commute, and have been deceived into thinking that rails will do this. Actually the cost of subsidising a mode-shifter to reduce pressure on road capacity, is in the long run, orders of magnitude higher than building more road capacity. The law of triple convergence suggests that driving will be “induced” anyway if there is enough mode shift to actually make driving easier than it was. Doing this by way of rail “investments” is merely an orders-of-magnitude more expensive way of enabling an increase in person-kms of travel in the urban economy. PT growth – massive – would suggest its not about de-congesting the roads. People themselves want to get off the roads. Rail up year on year and reaching capacity. Again, Phil, what do we do? Force them all back on the road? Even providing 3 to 5 times as much highway and arterial space per capita, as those US cities have done (hence their lower congestion delays), is cheaper than blowing 30 to 80 cents per person-km on moving people around on PT, in perpetuity. The cost of highways and arterials amortises over time, to converge on something below 1 cent per person-km subsidy cost – especially seeing much of the cost can be netted out against engineering and maintenance for heavy vehicles, not cars. You just named four truely awful cities. Have you ever been to any of them? Auckland and Wellington don’t have big congestion delay, that is clearly incorrect. What they have is very little congestion at all across the day, which manifests as a proportionate slowdown at peak times. Nick R, you are now just making stuff up. 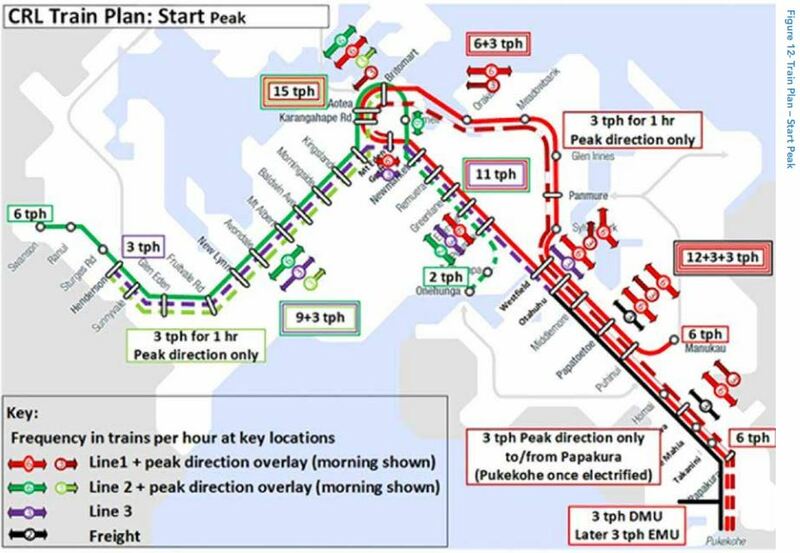 Auckland and Wellington have WORSE all-day delays across their entire networks AND a longer period during which peak delay is experienced. You can actually look at traffic cams for most cities these days if you want to get an eyefull – but the TomTom data will do for me. It is funny that “truly awful cities” can be growing so fast – Indy and Nashville are growing even faster than Auckland and yet manage to keep their house price median multiples around 3 and their congestion delays down to around 15 minutes, by just getting on and building freakin’ highways, suburbs and commercial hubs. In fact by believing in themselves and their existing cultural identity, they are attracting good-quality migrants who want to share in that identity, including the decent housing in nice green suburbs. Nashville and Indy would be mad to want to try to re-invent themselves as mini Hong Kongs and recreate the crowding, congestion, local pollution, and social injustice in housing – and Auckland is mad to be trying this. Auckland could be just as good as Indy and Nashville for everything, plus the beach/boat lifestyle that they can’t have. I fail to see how Auckland is becoming “more livable” rather than more “truly awful” – every time I visit, my impression is that it has got more truly awful. It has much of the same “awfulness” that the US cities do, only at higher density, worse pollution, and higher living costs. Its attractions are merely different to those of the US cities, not necessarily superior. Each to his own. Plenty of people migrating to the US cities, as I said; and at least they are not part of a process of turning them into mini Hong Kongs, which verges on social engineering and cultural self-sabotage. The Tom Tom data, before they stopped publishing the actual numbers, showed that Auckand and Wellington had very fast driving times across the day. That’s the only thing that makes peak congestion appear a lot slower. With Tom toms failed methodology any city that is congested right across the day appears good! NickR is making it up, I encourage readers to look at the TomTom Reports for themselves and see who is sticking to the facts. In any case, the TomTom methodology is based on the benchmark of “fastest trips” – which will be made late at night if at no other time. For NickR’s interpretation to be true, the US cities would have to have congestion 24 hours 7 days a week, and never have a fast trip time possible at all at any time, from which peak delay could be benchmarked. Why don’t you have a look at the facts yourself Phil. The methodology is clear, Tom Tom compares the peak to off peak travel times on road segments where it has enough Tom Tom users to get a representative sample, the aggregates these and simply divides one by the other. Auckland’s congestion index of 33% simply means that Tom Tom users in Auckland go 33% slower at peak time than at off peak time. Hardly a revalation. You might ask why Tom Tom stopped reporting the speed and travel time figures some years ago and have since only reported the derivative percentage ratio. My guess is because it revealed how utterly failed their index is. Oh and Tom Tom don’t record data 24/7, so your claim above is false. Tom Tom only gets data from its GPS users on road sections that have enough users driving along it at the same time to get a representative sample. It has an endogenous bias as a result, it means the only time Tom Tom can collect data is on busy roads at times where there are lots of users. It doens’t collect data across the vast majority of any city’s road network, just the main arterials, Likewise it doesn’t collect data acros most of the day, because at night and the early morning there are few drivers. So what you get is a measure of the difference in speed on arterial roads between peak time and the middle of the day. Some cities stay bad all day and get a good score, some cities stay fast all day and get a good score. Some cities are good most of the day but slow down at peak and get a bad score. I.e. It’s meaningless. 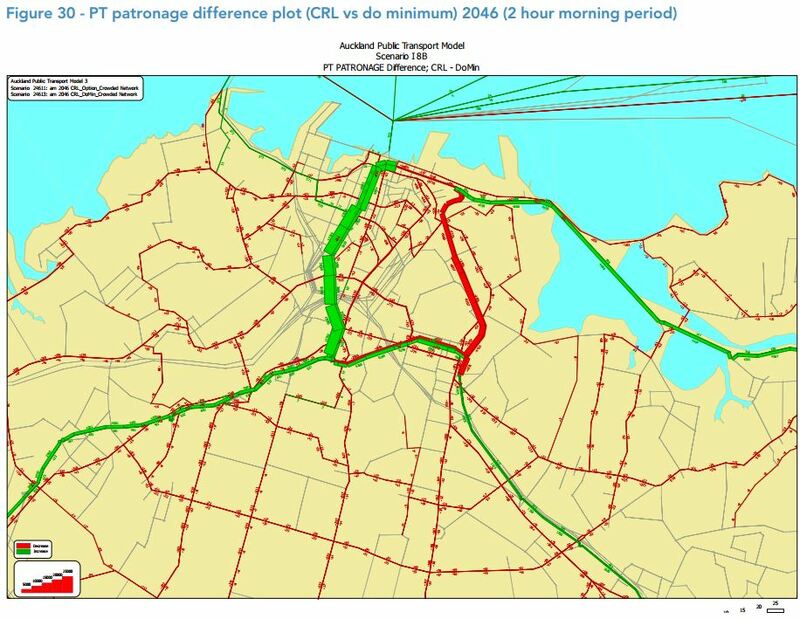 The fact that driving on Aucklands main roads at peak takes an average of 33% longer than during the middle of the day is utterly unremarkable on a global scale, all it tells us is we have very little traffic most of the day and things get a bit worse at peak times. Surprise! If you want bad traffic, go drive around São Paulo for a day. Then come back and tell me where on the supposed congestion index they are.
. . . “The cost of highways and arterials amortises over time, to converge on something below 1 cent per person-km subsidy cost ”. . .
How come otahuhu residental development feasibility is zero? Just reading the compaint above about “Auckland citizens financing the tax free property capital revaluation of those living around planned stations”. Funny, I’ve never heard this levelled at those living near motorway interchanges.